When you think about eating at a golf club, you suddenly don't feel so hungry, right? Images of cold sandwiches and overcooked chicken come to mind, while golfers strut about in their pink polo shirts. 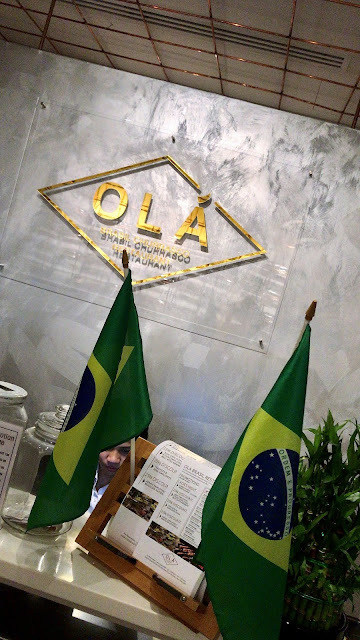 Well, that's why I was so surprised to find The Brazilian Ola at the Al Ghazal Golf Club, right across from the International Airport in Abu Dhabi. The restaurant is simply but elegantly decorated. It feels very clean and spacious, AND there is a HUGE outdoor area (for use in the cooler months) with a Kids Area, an outdoor TV screen for watching sports, and even an outdoor bar and Shisha Tent. This laid back eatery is a Churrascaria (BBQ'd meat is served hot from the grill "churrasco"). While they also serve salads and a few pasta dishes, it is the hot grilled meat that will leave you asking for more. Multiple cuts of beef, lamb, shrimp, chicken and even duck! The meat is of very high quality and you can taste it. There is just enough salt and pepper for seasoning, and nothing more. They offer you three traditional sauces, if you are into dipping...but the meat was honestly too tasty to even try the sauces. In traditional Churrascaria style dining, you eat as much as you like. Still hungry? Keep eating! They will keep bringing hot skewers of meat until you have had your fill. 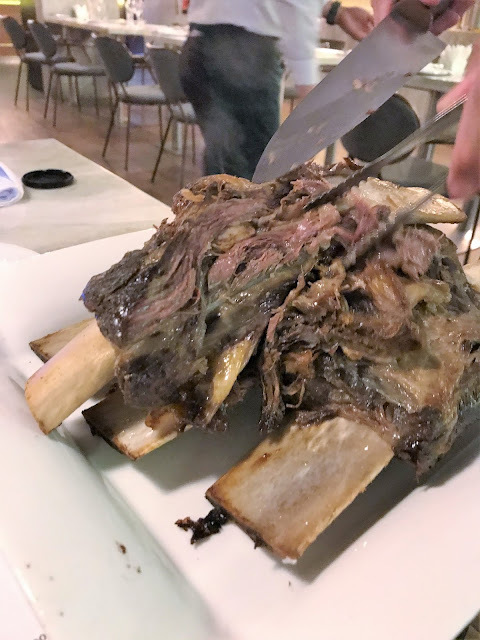 Ola is owned by the same owners as the very popular Madang Korean (also at the Al Ghazal Golf Club), and it is obvious as that the same focus on high quality food and friendly atmosphere comes through. The waiters are knowledgeable and very friendly. There is plenty of free parking, AND, a rare find in Abu Dhabi, the cocktails are amazing. Well made and strong. You absolutely must try the Caipirinha. Even if you have had one before, you have never had this one. End. Of. Story. The prices are really reasonable and the atmosphere is SO unpretentious. You won't need to calculate any 20% added Hotel Taxes into your bill, and you can bring the whole family and stay all day on the weekends. They even offer some awesome promotions, so be sure to check their Zomato site with the link below. Some may feel it is a bit of a drive if you don't live too close to the airport, but you will not be sorry that you made the trip.